The term rocket is used in two different ways: (1) it is used to describe a jet engine that does not depend on air for its operation but instead carries its own fuel and oxidizing agent, and (2) it is used to describe any vehicle that is powered by a rocket engine. For example, a fireworks device is a kind of rocket engine. It contains the fuel and oxidizing agent needed to put it into the air as well as the chemicals needed to give the colored display typical of fireworks. A rocket fired to the Moon illustrates both meanings of the term. The vehicle itself carries a rocket engine as well as living quarters for humans, equipment for experiments, instruments needed for communication, and other units. The rocket in this case is both the engine that propels the vehicle and the vehicle itself. A missile is an unmanned vehicle propelled through space, usually carrying some type of explosive device intended to do harm to an enemy. A missile, like a rocket, usually carries its own means of propulsion. It may also carry its own guidance system or, alternatively, it may be guided by a ground-based command center. Rockets have two primary functions. First, they are used to carry out research on Earth's atmosphere, other parts of the solar system, and outer space. Rockets designed to carry instruments no farther than the upper levels of the atmosphere are known as sounding rockets. Those designed to lift spacecraft into orbit or into outer space are known as boosters or as carrier vehicles. The second function of rockets is use as components of missiles. A large fraction of the research and development on modern rocketry systems has been carried out by or supervised by the military services. The operation of a rocket is based on Newton's third law of motion. According to that law, every action is accompanied by an equal and opposite reaction. An interesting illustration of this law is the method by which a squid propels itself through the water. The body of the squid contains a sac that holds a dark, watery fluid. When the squid finds it necessary to move, it contracts the sac and expels some of the fluid from an opening in the back of its body. In this example, the expulsion of the watery fluid in a backward direction can be thought of as an action. The equal and opposite reaction that occurs to balance that action is the movement of the squid's body in a forward direction. A rocket is propelled in a forward direction when, like the squid, a fluid is expelled from the back of its body. In the most common type of rocket, the expelled fluid is a mass of hot gases produced by a chemical reaction inside the body of the rocket. In other types of rockets, the expelled fluid may be a stream of charged particles, or plasma, produced by an electrical, nuclear, or solar process. Chemical rockets are of two primary types: those that use liquid fuels and those that use solid fuels. The most familiar type of liquid rocket is one in which liquid oxygen is used to oxidize liquid hydrogen. In this reaction, water vapor at very high temperatures (about 2700°C, or 4,900°F) is produced. The water vapor is expelled from the rear of the rocket, pushing the rocket itself forward. Ballistic missile: A missile that travels at a velocity less than that needed to place it in orbit and that, therefore, follows a trajectory (a curved path) back to Earth's surface. Binder: A material used to hold the fuel and oxidizer together in a solid-fuel rocket. Booster rocket: A rocket designed to lift a spacecraft into orbit or into outer space. Carrier vehicle: Another name for a booster rocket. Grain: The fuel in a solid propellant. Liquid-fuel rocket: A rocket in which both fuel and oxidizer are in the liquid state. Plasma: A mass of very hot charged particles. Solid-fuel rocket: A rocket in which both fuel and oxidizer are in the solid state. 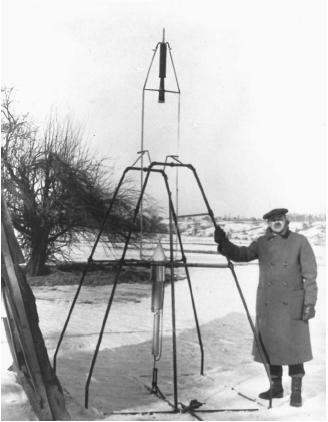 Sounding rockets: Rockets designed to travel no farther than the upper levels of Earth's atmosphere. The liquid oxygen/hydrogen rocket requires an external source of energy, such as an electric spark, to initiate the chemical reaction. Some combinations of fuel and oxidizer, however, ignite as soon as they are brought into contact. An example is the liquid combination of nitrogen tetroxide and monomethylhydrazine. These two compounds react with each other spontaneously to produce a temperature of about 2,900°C (5,200°F). A third type of liquid rocket uses only a single compound. That compound decomposes, producing gases that propel the rocket. An example is hydrogen peroxide. When hydrogen peroxide decomposes, it produces oxygen and water vapor at temperatures of about 745°C (1,370°F) that are ejected from the back of the rocket. Advantages and disadvantages of liquid rockets. Liquid-fuel rockets have a number of advantages. First, they can be turned on and off rather simply (at least in concept) by opening and closing the valves that feed the two components to each other. Also, they tend to provide more power than do solid rockets. Finally, when problems develop in a liquid-fuel rocket, they tend to be less serious than those in a solid-fuel rocket. However, liquid-fuel rockets also have a number of serious disadvantages. One is that the liquid components often require very special care. Also, liquid fuels must be added to a rocket just before its actual ignition since the components cannot be stored in the rocket body for long periods of time. Finally, the mechanical demands needed for the proper operation of a liquid-fuel system can be very complex and, therefore, subject to a number of possible failures. In a solid-fuel rocket, the fuel and oxidizer exist in the solid, rather than the liquid, state. The combination of fuel and oxidizer, along with a binder to hold them together, is called the grain. The grain usually has a claylike texture. When ignition occurs, the oxidizer reacts with the fuel to produce hot gases that propel the rocket in the same way as with liquid rockets. Many combinations of materials have been used for the grain in a solid-fuel rocket. One common mixture consists of powdered aluminum metal as the fuel and ammonium perchlorate or ammonium nitrate as the oxidizer. The flame produced by the reaction between these two substances has a temperature of at least 3,000°C (5,400°F). Nitroglycerine in combination with easily oxidizable organic compounds is also widely used. Such combinations have flame temperatures of about 2,250°C (4,100°F). Advantages and disadvantages of solid fuel rockets. Like liquid-fuel rockets, solid-fuel rockets have both advantages and disadvantages. A solid-fuel rocket can be fueled a long time in advance of a launch without much danger of the fuel's deteriorating or damaging the rocket body. The construction of the rocket body needed to accommodate the solid fuel is also much simpler than that needed for a liquid-fuel rocket. Finally, the fuels themselves in a solid-fuel rocket tend to be safer and easier to work with than those in a liquid-fuel rocket. Still, solid-fuel rockets have their own drawbacks. Once the fuel in a solid-fuel rocket begins to burn, there is no way to slow it down or turn it off. That means that some of the most serious accidents that can occur with a rocket are those that involve solid-fuel combustion that gets out of control. exploring the possibility of using nuclear reactors to power rockets. A nuclear-powered rocket would carry a small nuclear reactor, the heat from which would be used to vaporize hydrogen gas. The hydrogen gas expelled from the rear of the rocket would provide its propulsive force. Calculations indicate that a nuclear rocket of this type would have a lifting force more than twice that of a traditional chemical rocket. 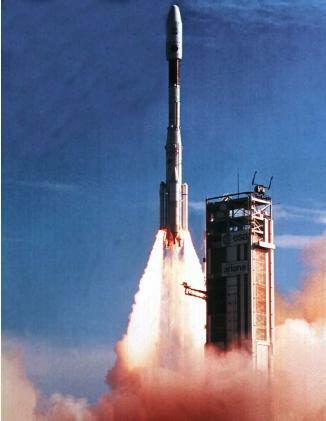 Other types of so-called low-thrust rockets have also been suggested. In some cases, the proposed propulsive force comes from atoms and molecules that have been ionized within the rocket body and then accelerated by being placed within a magnetic or electrical field. In other cases, a gas such as hydrogen is first turned into a plasma and then ionized and accelerated. As attractive as some of these ideas sound in theory, they have thus far found relatively few practical applications in the construction of rocket engines. The modern age of missile science can probably be said to have begun towards the end of World War II (1939–45). During this period, German rocket scientists developed the ability to produce vehicles that could deliver warheads to targets hundreds or thousands of miles from their launch point. For a period of time, it appeared that the German V-2 rocket-missile might very well turn the tide of the war and bring victory to Germany. The cold war that followed the end of World War II provided a powerful incentive for the United States, the former Soviet Union, and a few other nations to spend huge amounts of money on the development of newer and more sophisticated missile systems. Missiles have the great advantage of being able to deliver a large destructive force at a great distance from the launch site. The enemy can be damaged or destroyed with essentially no damage to the party launching the missile. As the cold war developed, however, it became obvious that the missile-development campaign was a never-ending battle. Each new development by one side was soon made obsolete by improvements in anti-missile defense mechanisms made by the other side. As a result, there is now a staggering variety of missile types with many different functions and capabilities. Missiles can be classified in a number of different ways. Some are said to be unguided because, once they are launched, there is no further control over their flight. The German V-2 rockets were unguided missiles. Such missiles can be directed in the general vicinity of a target at the launch site, but once they are set off there is no further way that their path can be adjusted or corrected. The vast majority of missiles, however, are guided missiles. This term refers to the fact that the missile's path can be monitored and changed either by instruments within the missile itself or by a guidance station. Missiles can also be classified as aerodynamic or ballistic missiles. An aerodynamic missile is one equipped with wings, fins, or other structures that allow it to maneuver as it travels to its target. Aerodynamic missiles are also known as cruise missiles. Ballistic missiles are missiles that follow a free-fall path once they have reached a given altitude. In essence, a ballistic missile is fired into the air the way a baseball player makes a throw from the outfield, and the missile (the ball) travels along a path determined by its own velocity and Earth's gravitational attraction. Finally, missiles can be classified according to the place from which they are launched and the location of their final target. V-2 rockets were surface-to-surface missiles since they were launched from a station on the ground in Germany and were designed to strike targets on the ground in Great Britain. An air-to-air missile is one fired from the air (usually from an aircraft) with the objective of destroying another aircraft. One of the best known air-to-air missiles is the U.S. Sidewinder missile, first put into operation in 1956. The first Sidewinders were 2.84 meters (9.31 feet) long and 12.7 centimeters (5.00 inches) in diameter, with a weight of 75 kilograms (165 pounds) and a range of 1.1 kilometers (0.68 miles). A surface-to-air missile is one fired from a ground station with the goal of destroying aircraft. The first surface-to-air missile used by the U.S. military was the Nike Ajax, a rocket with a weight of 1,042 kilograms (2,295 pounds), a length of 10.6 meters (34.8 feet), a diameter of 30.5 centimeters (12.0 inches), and a range of 48 kilometers (30 miles). Some other types of missiles of importance to the military are antiship and anti-submarine missiles, both of which can be launched from ground stations, from aircraft, or from other ships. Military leaders were at one time also very enthusiastic about another type of missile, the anti-ballistic missile (ABM). The ABM program was conceived of as a large number of solid rockets that could be aimed at incoming missiles. U.S. engineers developed two forms of the ABM: the Spartan, designed for long-distance defensive uses, and the Spring, designed for short-range interception. The Soviet Union, in the meanwhile, placed its reliance on an ABM given the code name of Galosh. The ABM program came to a halt in the mid-1970s when the high cost of implementing a truly effective defensive system became apparent. Any missile consists essentially of four parts: a body, known as the airframe (described above); the propulsive system; the weapon; and the guidance system. The propulsive systems used in missiles are the same as those described for rockets. That is, they consist of one or more liquid rockets, one or more solid rockets, or some combination of these. In theory, missiles can carry almost any kind of high-explosive, chemical, biological, or nuclear weapon. Anti-tank missiles, as an example, carry very high-powered explosives that allow them to penetrate a 60-centimeter (24-inch) thick piece of metal. Nuclear weapons have, however, become especially popular for use in missiles. One reason, of course, is the destructiveness of such weapons. But another reason is that anti-missile jamming programs are often good enough to make it difficult for even the most sophisticated guided missile to reach its target without interference. Nuclear weapons cause destruction over such a wide area, however, that so-called defensive jamming is less important than it is with more conventional explosive warheads. At one time, the methods used to guide a missile to its target were relatively simple. One of the most primitive of these systems was the use of a conducting wire trailed behind the missile and attached to a ground monitoring station. The person controlling the missile's flight could make adjustments in its path simply by sending electrical signals along the trailing wire. This system could be used, of course, only at a distance equal to the length of wire that could be carried by the missile, a distance of about 300 meters (1,000 feet). The next step up from the trailing wire guidance system is one in which a signal is sent by radio from the guidance center to the missile. Although this system is effective at much longer ranges than the trailing wire system, it is also much more susceptible to interference (jamming) by enemy observers. Much of the essence of the missile battles that took place on paper during the cold war concerned finding new and more secure ways to send messages to a missile—and new and more sophisticated ways to interrupt and jam those signals. Some missile systems carry their own guidance systems within their bodies. One approach is for the missile to send out radio waves aimed at its target and then to monitor and analyze the waves that are reflected back to it from the target. With this system, the missile can constantly make adjustments that keep it on its path to the target. As with ground-directed controls, however, a system such as this one is also subject to jamming by enemy signals. Another guidance system makes use of a TV camera mounted in the nose of the missile. The camera is pre-programmed to lock in on the missile's target. Electronic and computer systems on board the missile can then keep the rocket on its correct path. thanks for the article, this has helped me for my assignment and now i understand. Thanks! I really needed that info for my engineering class. Im doing a report on the history of flying things. Anyone know any other good sites for planes, hot air balloons, etc.? thx now i Know so much about rockets and missles and I'll get a great grade with my school and i hope u will have more info next time. i really owe u one guys! tnx a lot for these precious information, i wonder if there is a table that sorts different types of missiles for example SSM or ASM ..., and if there are branches for these types of missiles (for example onshore to ship missiles or submarine to ship missiles) .anyone know other sites or such tables that can help me ? I want to carry out a project. Over the weeks, i have being confused not until now that 've read this. What is left now is sponsorship. Wow. Thanks to all who put this page together. Glove you all.